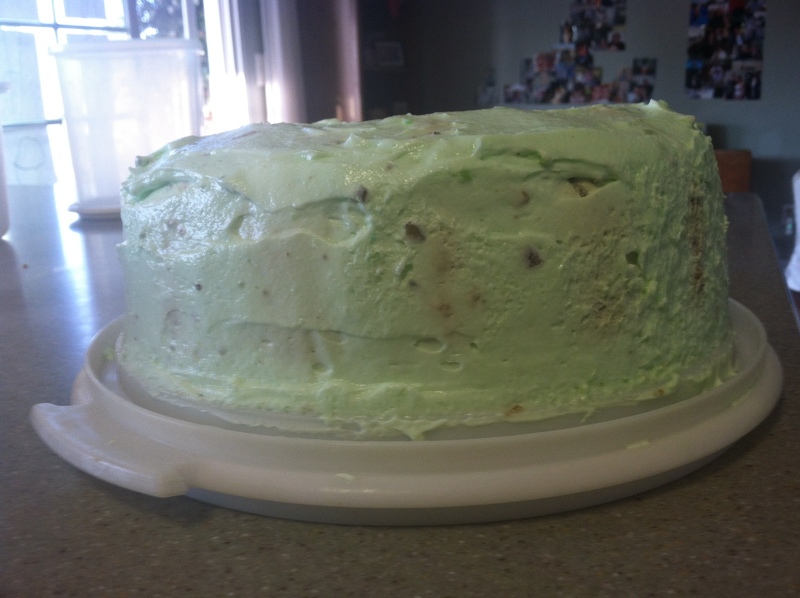 In honor of St. Patrick’s Day here’s a great dessert you can whip up for the cake lovers in your family. I posted this recipe last summer, and thought this would be a great time to share it again. This cake recipe is a yummy little recipe that my Mom has made for me over the years for my birthday. It’s one of the top 5 moist cakes around. I imagine that you could use other flavors of cake mix and pudding mix to change it up, but my favorite has always been the pistachio flavor. Not everyone loves the pistachio flavor like I do, but I have to say everyone at my house tried it and liked it. Mix all of the ingredients well and pour into your favorite angel food or bundt pan. Grease the pan first. Bake at 350º for 5o minutes. 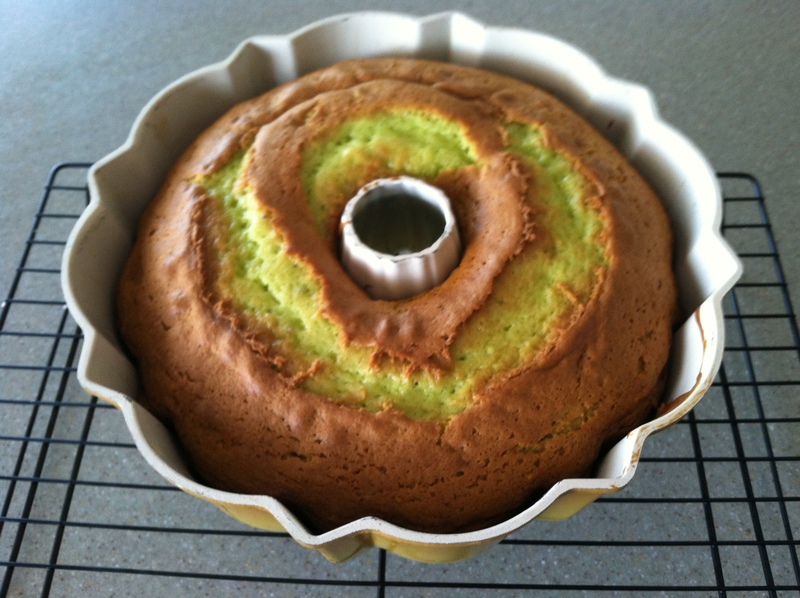 Let this cool on a wire rack, and then remove from the pan on to a plate for frosting and serving. If you have the time, refrigerate the cake overnight before frosting. This will keep the cake really, really moist. Beat all of the ingredients well. The frosting mixture should form small peaks, just like a whip cream style frosting. Frost the cooled cake and refrigerate or serve immediately for your eating pleasure. And don’t forget the milk or coffee to go along with it. 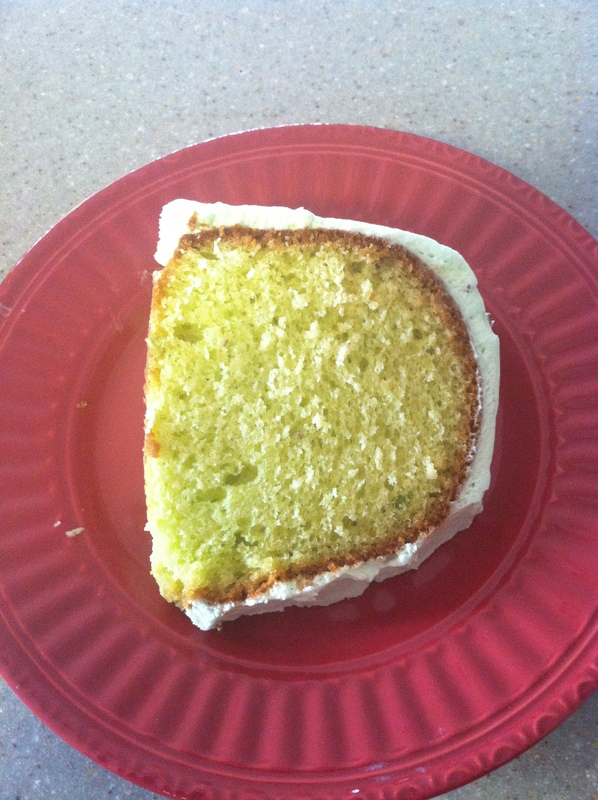 This is a great summer time cake. The frosting is light, and the cake is moist. This was a welcome home treat for my Travel Man, and it did not last long. A great recipe to pass along. Thanks Mom! This looks delicious. I hope I remember to buy pistachio pudding next time I go to the store so that I can try it! Is is a great recipe. The pudding makes it really moist. Thanks for stopping by today! That cake looks yummy–I’ll bet it’s pretty on the inside, too. Thanks for stopping by my blog today! It is a scrumptious one!! Lovely yellow on the inside. Glad you stopped by for a visit today. Thanks for the re-blog. Love your collection of recipes!